Save $500 to $800 per couple off this departure. Expires April 30. Click here. Hot deals! Save $1,000 per couple off this tour. Expires April 30. Click here. 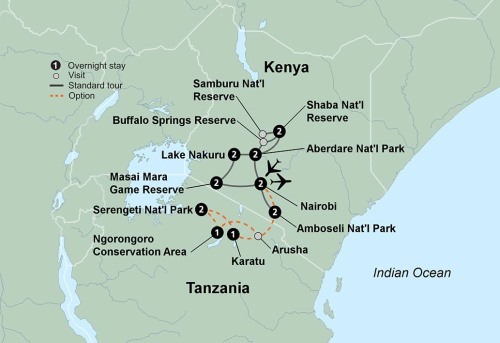 A continent of adventure stirs the soul in Kenya, the heart of safari country. Spend the night at Nairobi’s first luxury hotel, the Sarova Stanley. Complement your journey with an opportunity to give back to nature with a “seedball.” The compact balls of seed limit the cost of planting indigenous trees around the world. A moment of impact can grow into a lifetime of change, so toss your seedball out the window anytime during your journey. An unforgettable safari adventure waits for you in Africa. In Swahili, “Safari” means Journey. To you, it will mean just that – and so much more. Explore the magnificent vistas of Kenya, home to incredible wildlife, from cheetahs to wildebeests. Discover the thriving cultures and innumerable natural wonders that make this one of the most popular African countries to visit. Go in search of elephants, lions, buffalo, rhinos, and leopards – collectively known as the “Big 5” and other animals on eleven game drives. Feed Rothschild Giraffes at the Giraffe Sanctuary. Visit the beautiful Masai Mara Game Reserve, and top off a full day game drive with a traditional dinner in the bush and a Masai dance performance. Meet a member of the Samburu tribe who opens you up to the culture, folklore, and the African tradition. These are the plains of Africa, where unparalleled adventure greets you at every turn.